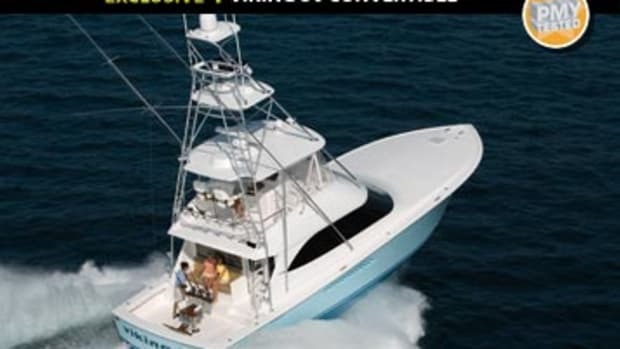 If there’s one thing I’ve learned about big sportfishing boats, it’s this: They’re not just about speed. Still, when I saw “38 kts” pop up on the center 19-inch KEP helm monitor, I was impressed. 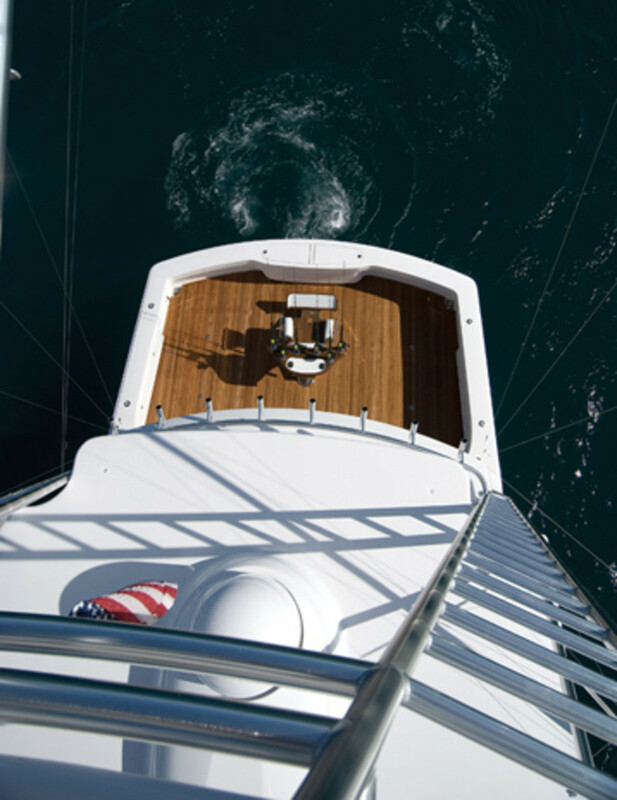 Maybe that’s because it felt more like 20 knots up on the Viking 82’s flying bridge, some 17 feet off the water. Or maybe it was the utter effortlessness with which the big convertible made that number. 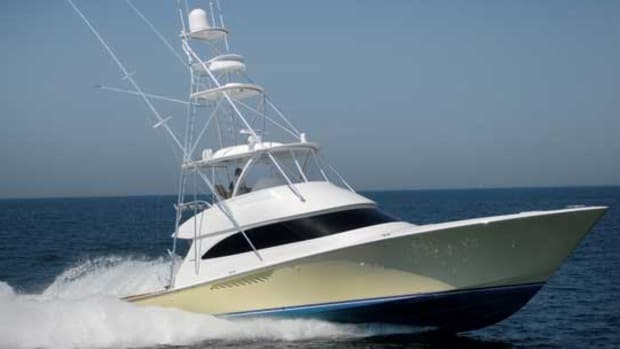 If there’s one thing I’ve learned about big sportfishing boats, it’s this: They’re not just about speed. Still, when I saw “38 kts” pop up on the center 19-inch KEP helm monitor, I was impressed. 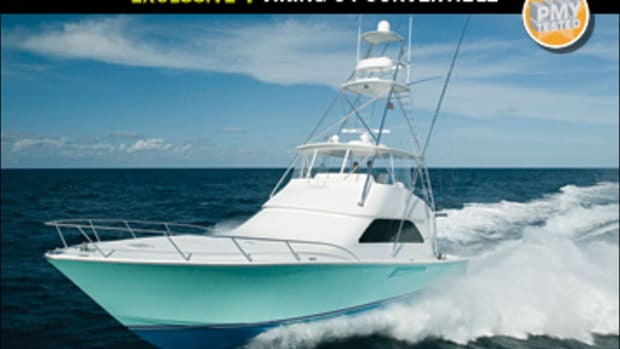 Maybe that’s because it felt more like 20 knots up on the Viking 82’s flying bridge, some 17 feet off the water. Or maybe it was the utter effortlessness with which the big convertible made that number. She didn’t dig a hole coming on plane or make much of a wake once she was up and running. Nor was there any vibration or much sound from her V-16 MTUs. Underwater exhausts and a lot of acoustical engineering ensured that what I did hear came from the water impacting the hull, not from the 4,800 hp beneath my feet. And her handling was just as effortless. 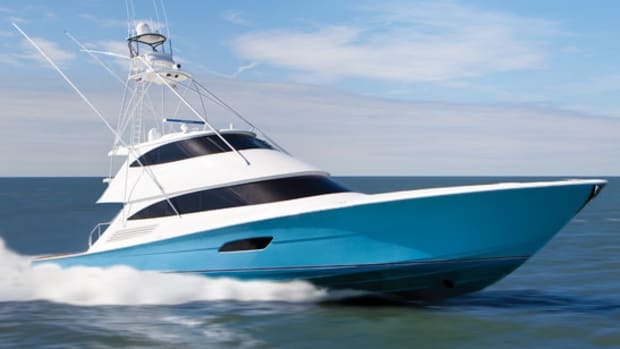 That such a big boat can be so remarkably light-footed is partly due to her unique electronic steering system (see “Noteworthy: PICES,” this story) and partly to a new hull that’s loosely derived from the Viking 74. Tank tested at the Stevens Institute, it’s convex forward, instead of concave like the 74, to produce a soft ride in a head sea. It’s also flatter aft—a 10-degree deadrise compared to 15 for the 74—and features deep propeller pockets that produce a draft of 5&apos;6", an inch less the 74’s. 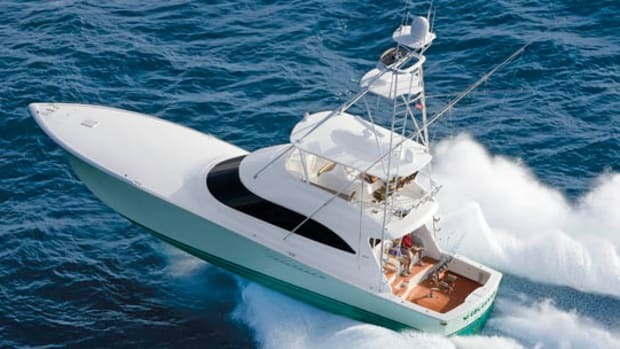 Add to that a third centerline trim tab that’s two feet wide and three 1,000-gallon fuel tanks aligned fore to aft (a fourth 600-gallon tank is optional) connected by a fuel-transfer system, and you have tremendous flexibility in running trim. By loading or unloading the tanks, or leaving one or two empty, and manipulating the centerline tab, you can dial in a running angle that’s anywhere from flat, to punch through a head sea, to as much as six degrees up-bow, to preclude stuffing in a following sea. 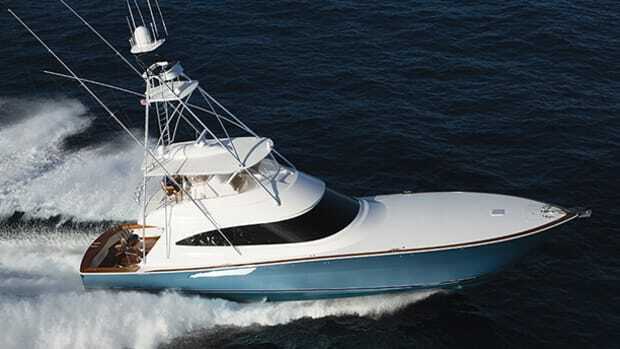 Maneuvering this 162,250-pounder is also effortless, especially when backing down, principally because of her 40-hp hydraulic bow thruster. Who uses a bow thruster when fighting a fish? No one. Why? Because you can’t work the gear levers and the thruster joystick and still keep an eye on what’s happening in the cockpit. But Viking offers the option of thruster controls in the gear levers—buttons on the inboard (thumb) side of each T-handle. With them you can work the gears and thruster simultaneously while facing aft and even spin the 82 on her midpoint, if you want to. And since the thruster is hydraulic, you can lean on it all you want without the fear of tripping a thermal breaker, something you’ll appreciate when trying to horse this behemoth into a slip against wind and current. By the way, when you pull those levers into reverse, all three tabs automatically retract so you won’t snag your lines on them. Something else makes the 82 easy to back down: her curved transom. It’s one of a number of styling cues that set the 82 apart from other Vikings and foreshadow what we’ll see in future models. The curvature deflects water to the side instead of plowing into it. At seven knots in reverse our test boat shipped no significant water. Other less piscatorially oriented aesthetics include a new shape for the main-deck side windows and the absence of a deckhouse (a first), which produces a flush (and very long) foredeck that is, believe it or not, ten feet off the water. (The 82’s foredeck is actually farther off the water than the Viking 61’s bridge deck.) Note also the port and starboard hull-side windows for the master (optional) and the black “windshield” that’s both recessed about an inch to eliminate the problematic paint line and more raked than on any other Viking. Metallic flakes in the black paint help reflect solar radiation. Also new are corner hawse pipes sized to accommodate both mooring lines and the standard port and starboard Glendinning 100-amp shore-power cords. They pass through a cockpit that is, as you’d expect, laid out for serious angling. 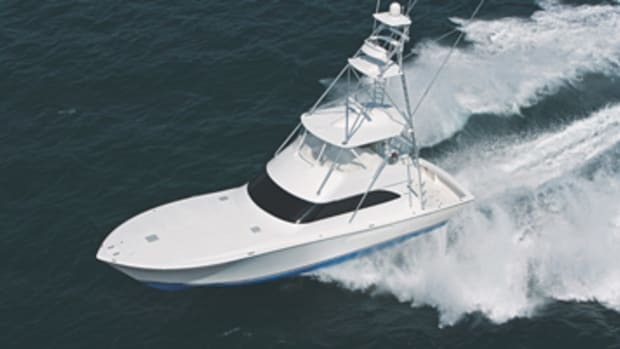 The in-sole compartments and the modules that line the forward end beneath the mezzanine seating can be configured in a nearly infinite number of ways, as on any custom sportfisherman. But a number of details belie Viking’s tournament experience. There’s a two-inch plug in each corner scupper that can be unscrewed to accommodate the overflow hose of a portable baitwell. A small locker in the forward port corner is dedicated to chamois and squeegees. (There’s another on the bridge.) 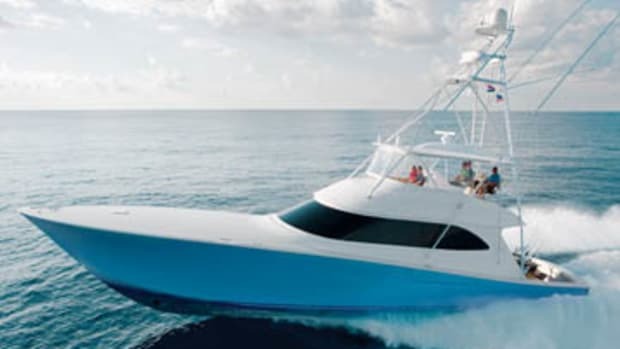 The quick-connect in the forward starboard corner lets you change engine and genset oil from the dock—no more lugging five-gallon buckets on and off the boat. (Another quick-connect is in the engine room.) Optional tachs and oil pressure gauges mounted just inside the engine room door tell you what’s happening without forcing you to go inside or up to the bridge. As for the engine room itself, everything in it, save two aqua battery chargers, is gloss white. It’s such an unrelentingly arctic space, I almost expected to be greeted by a guy in a parka. The impression is heightened by the fact that the ER is also utterly uncluttered, so much so that at first I thought perhaps some equipment was missing. It was not; it was just positioned so as not to be in the way. Twin 32-kW Onan gensets are aft but also out of the way, under the mezzanine; remove a few machine screws and they slide forward so you can easily work on them. Or pull the cockpit fishboxes to reach their aft sides. (Everything aboard from engines to the water heater can be removed.) To keep things quiet in the saloon, the overhead is a single piece of cored FRP, no small feat on a boat that’s 22&apos;4" wide. Beneath the diamond-plate between the engines are two 240-volt swimming pool pumps that circulate raw water to everything that needs it, from air conditioners to washdowns to livewells. Why two? One’s a backup. Why swimming pool pumps? Because you can get parts for them almost anywhere in the world. There’s more smart thinking on the bridge. 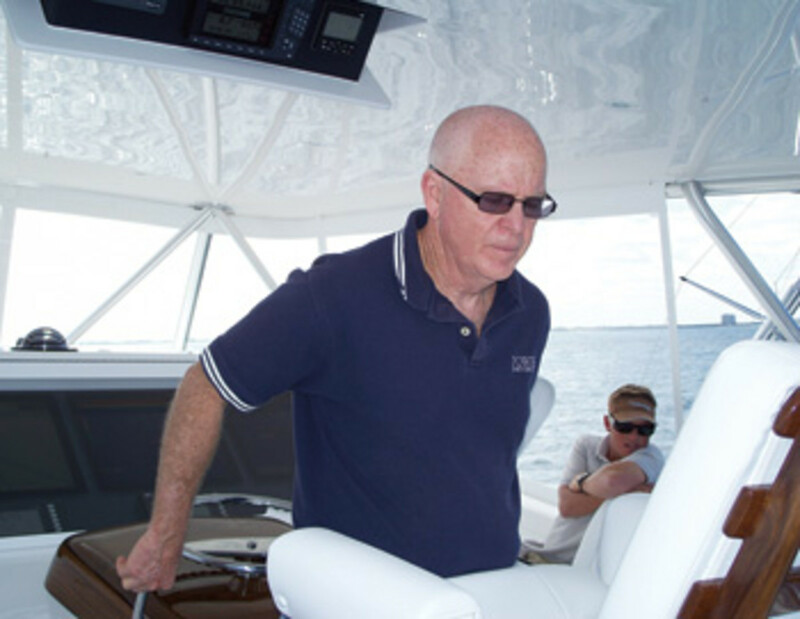 The compartment in the hardtop for the teaser reels contains two VHF speakers so the captain can monitor chatter while watching baits. He has great sightlines fore and aft because he stands on an elevated platform. Inside the console are two batteries dedicated to the electronics and a thermostatically controlled exhaust fan to make sure none of the many electronic gizmos fries on a hot day. Chances are that owner will be coming out of a Viking. The company has sold a remarkable 45 74s since it debuted the model in 2003. 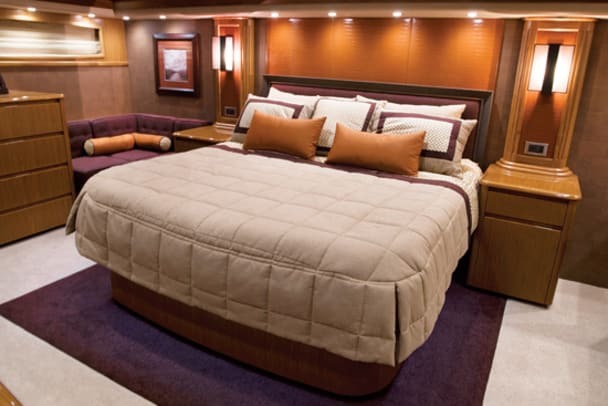 Until now, owners of them who wanted to move up to a bigger boat often ended up going to custom builders. The 82 was designed to ensure that they won’t have to. Or want to. 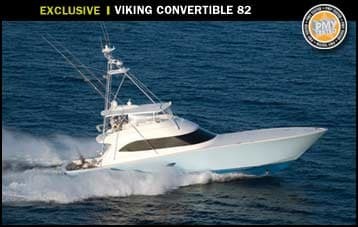 For more information on Viking, including contact information,click here. 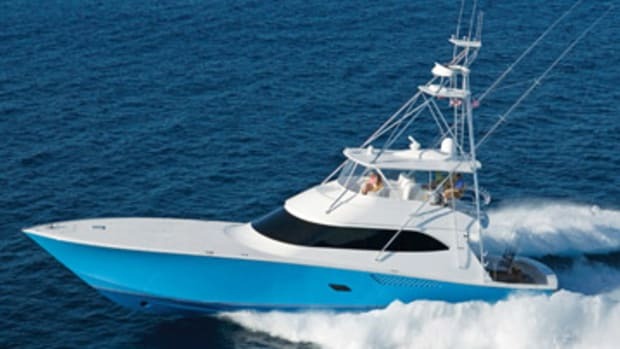 Steering: PICES electronic Controls: MTU electronic w/ Sturdy levers; Moritz Octoplex Power Systems control; hydraulic bilge pumps and bow thruster; Tides Marine dripless shaft and rudder seals; 10-ton chilled-water A.C.; Delta T ER vents; 3/independent 24-volt battery banks; 2/32-kW Onan gensets; 2/Glendinning 100-amp shore-power cords; 4/Rupp s/s rod holders; LED lighting throughout; Pioneer 50" plasma TV and Bose Lifestyle 48 in saloon; washer and dryer; freshwater washdown in bow; anchor w/ 25&apos; chain and 225&apos; line; centralized 220-volt raw-water pump.